This certainly has been an unusual winter here in the Thumb. The atmosphere mostly represented spring-like weather, and a lack of snow, which in turn may have prevented me from getting a few “lumps”. Then just recently over a foot of snow (my 14 inch rubber chore boots are topped out in the white-stuff) dropped down on our farm, almost overnight. Old Man Winter seems to be making up for lost time, which has me pondering taking advantage of it. I must admit I’m not much of a skier. I tried downhill skiing once, but quickly discovered I was an accident waiting to happen. This occurred right after I was out of high school and I went with friends to “Bear Mountain” in Grayling (my main reason for going was to visit the Bear Museum owned by the legendary bowhunter Fred Bear). I soon found myself in stiff boots attached to rental skis and on a lift going up the hill. Needless to say I should have started at the beginner hill, but one of my friends called it the “kiddy hill” and I didn’t want to be seen on it. The options at the top of the lift were the “Big Bear” run, which I knew was suicide on my part, and the intermediate hill which caught my eye, and I figured I could handle it. When we reached the top, I hopped off the lift seat with the person next to me, but got smacked in the face with the arm of the other person launching off, and I began sliding downhill in reverse. Fortunately I fell down in the nick of time or my first skiing experience would have been going down “Big Bear” backwards. The intermediate hill proved quite nice and something I could handle and it reminded me of sledding, except I was standing up and I loved every minute of it and found it quite exhilarating. It seemed I had a natural sense for balance on skis and my fear of falling quickly dissipated. Then came the curve you couldn’t see around and I was hugging the inside of it. As I rounded the bend I encountered a lady doing a slow “snow-plow” with her ski-tips close together, and I was fast gaining on her. When I suddenly caught up to her, I had a tree on my left and a skier on my right and I did all I knew what to do right then, which was to sit down. I found out right away sitting down on the back of your skis doesn’t do a thing and my skis slipped between the lady’s skis which in turn caused her to lose her balance and she fell backwards and landed in my lap with a shrill shriek. With our combined weight resting on our skis our speed really picked up for a thrilling ride down the remainder of the hill. The lady’s shrieks turned into infectious, hysterical laughter and I joined in. I do believe we were quite a sight sailing down that hill, and it was a real pleasure meeting a total stranger with a wonderful sense of humor. I realized right then it was time to go visit the museum and I never pondered skiing again until a couple years ago. I’ve always wanted to try cross-country skis but never took the plunge, probably due to still being punchy about my first and only downhill (literally) experience. But then I spotted some Swiss Army surplus skis in a catalog and at a deal. I automatically ordered a couple sets with great local wintertime plans in mind. 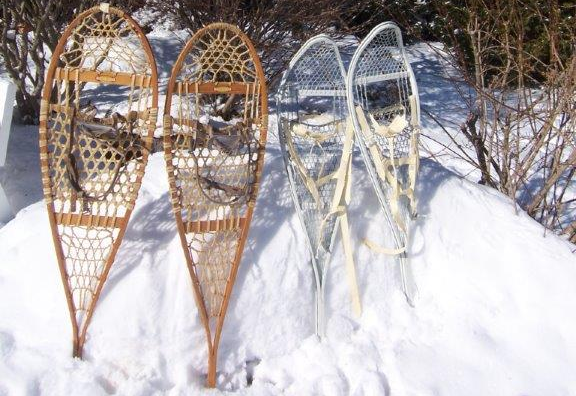 I was real excited when the long boxes arrived and the ski sets came with poles and even sealskin slipovers for travelling uphill. The foot attachment worked with hunting boots (which was one of the facts that attracted me besides price) and could be locked down for downhill work or unlocked to create a hinge effect for cross-country work. The instructions for the skis were in a foreign language, French I believe, but I didn’t need any translation to see how everything worked. I was as excited as a kid who had just opened up a special package on Christmas morning, and it was winter and I had just plowed the snow in my driveway, which I knew would provide the perfect conditions for trying it all out. I quickly donned the skis, left the foot attachments in the locked, downhill mode and readied myself for takeoff from the front of my garage. Now my driveway runs uphill from the road all the way to the garage, and even entails a bit of an S-turn near the entrance, which also has my mailbox. Upon launching, maybe a tad too vigorously, I quickly realized a freshly snow-plowed driveway (the snow was the real cold and dry powdery stuff, obviously the perfect “powder” I’ve heard about for skiing) offers a real slick surface for skis and I hit top speed almost immediately. I could see I still had that natural knack for staying upright and it was exhilarating to say the least, and obviously I hadn’t learned a lesson from my first downhill experience many years before. I still had no idea at all as to how the brakes work on a set of skis and I wasn’t slowing down a bit. My original intent had been to scoot down a short ways just to see how everything worked. I negotiated the S-turn with no problem and even managed to miss colliding with my mailbox that is set on a sturdy set of wooden 4×4’s. It was when the mailbox whisked by that I knew I might be in trouble, and then I skimmed right across the road and briefly experienced the thrill of ski-jumping as I sailed right over the roadside ditch on the other side. Somehow I managed to stay upright during all this (the fear of falling while at a high rate of speed is quite inspirational in this instance) and the snow in the (very level) field on the other side of the road was deep and fluffy and quickly slowed me down. Fortunately for me there was no traffic on my country road right then, and there could have been the county snowplow that was busy that day due to a recent snowstorm. Well folks, I took those skis off and they have been gathering dust on top of a cupboard in my garage ever since. 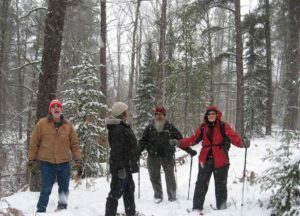 When it comes to wintertime travel the old fashioned way, I’ve long been an avid snowshoe fan and no doubt there is an obvious reason why. They work admirably for me, are simple to come to a stop with (all you have to do is stop moving) and there is no temptation to slip into a fast downhill mode. However, those Swiss Army skis gathering dust seem to be talking to me, especially since the recent snowstorm arrived with plenty of snow. I don’t know why because I know better, but those skis are tempting me (skimming along on snow cross-country has always appealed to me). Maybe it has something to do with what I’ve heard as being a midlife crisis, whatever that means. I don’t see any crisis afloat here, well maybe not much anyway as long as I figure out where the brakes are on a set of skis. The key here I believe, is to start out slow and easy on the flat and level.